Boracay Island. A name, that is quite known in the world of tourism. It is a small island just about an hour by plane from Manila. The actual distance from the capital is around 198 miles. Boracay is in the Western Visayas. The island is governed by the government of Aclan. People on Boracay Island speak Engish and Tagalog. Since it’s a touristy place, most people speak english very well so you can ask your way around easily. Boracay Island has received several awards like “Best island in the world” best beach in the world etc. In the end, it’s up to you to judge for yourself. Some people love it, some will never ever come back. Depends what you expect. But– “Best island in the world”? Some jouralists like to accept free drinks before writing – we guess …. Of course we don’t talk about the one who wrote that statement. The fastest way to get to Boracay Island is, to either take a plane from Manila to Caticlan or to Calibo. If you can make it to Caticlan, it’s the most convenient. From the airport you can get to the ferryterminal by tycicle in 10 minutes. For little money (around 50 Pesos) you take a boat to Boracay. From there again via trycicle to – where ever you want to go. There are many kinds of hotels on Boracay Island – and even some cheap ones that are affordable for travellers. Well – since you are on the page that works together with “Boracay sailing” of course we recommend our own sailboat, the “Misty Morning” It is a Paraw sailboat. A Paraw is the typical sailboat design in the Philippines. Have a look under: Sail boat charter Boracay. 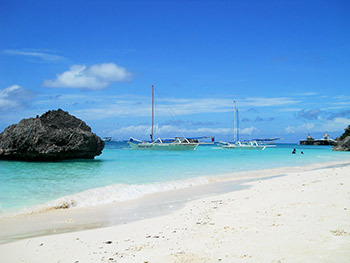 Many other things to do like island hopping and Boracay water sports activities you’ll find infos about on this page. There are these amazing sunsets on Boracay Island. A paradise for fotografers and people who just like to watch it or go for a stroll in the Island's warm evening sun on the white beach. If you want it even more personal, you can charter sailboat to go sunset sailing before dining out in one of the uncointed restaurants or enjoy Boracay Island's nightlife. Thank you for having visited the site Boracay Island hopping - sail boat charter & rental. For booking inquiries, please use our booking form only! Professional advice for Sailing & Charter proposals, further info & ideas.